We awoke to a beautiful peaceful scene on the Rio Guadiana. The river is over 20 miles long and quite wide but the channel is narrow in places so care is required to ensure there is plenty of water under the keel. We left around 1100 as we needed to wait until high water as the current runs very fast in the river. It took us 2 hours to travel the 8 miles from our overnight stop to the harbour entrance. We went under the suspension bridge again but with less height as it was high tide. A big sigh of relief when we successfully sailed underneath it. 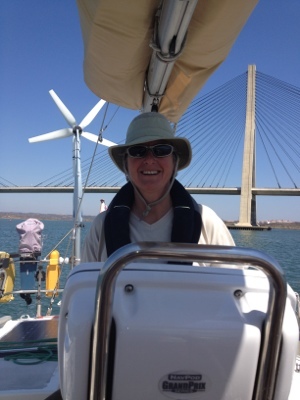 We then had a fabulous sail for the 40 miles to Mazagon in Andalucia. It is on the Huelva river and was where Columbus set out from so of historical significance at least. For us, it was a stopping point half way to Cadiz with no tidal constraints. We also thought we could watch the Olympic Opening Ceremony on BBC iPlayer but we have found that they don’t have Wifi and the electricity connections are unique so we haven’t got either! Luckily, the TV has picked up a number of Spanish stations so we are currently watching the men’s gymnastics. This entry was posted in News and tagged 2012, Spain. Bookmark the permalink. 1 Response to Adios Portugal, Hola Espana! We watched the opening ceremony. It was wonderful if rather eccentric in parts! I was sorry not to see the queen land in the arena!